Hunky Bingo Casino will then reward you with a bonus (Welcome Bonus is for new players only). The terms and conditions of the bonuses vary between different casinos and might also change over time and between different countries, so it is important to compare the different offers and read the T&C for Hunky Bingo Casino before signing up. Hunky Bingo Casino is considered to be one of the newer bingo sites on the internet as it was launched only a few years ago in March 2015. However, in this short time, it has managed to establish its very own niche and build a loyal customer base. The bright and colorful website itself is very appealing to the users. The innovative site design only added to its flair. New bingo games are added regularly on the site along with daily free spins for everyone. The government of Gibraltar provides the license to this casino site. During its first launch, the site ran on DragonFish software. However, it has since moved from there to another developer named Real Bingo Network. This move happened in the year 2016. Ever since the move, they have drastically changed their bonus terms and currently have no wager requirements. • Hunky 90: This is a simple bingo, which hardly needs any explanation. This is the very first game that any new user would play on HunkyBingo. At just £5 per ticket, it is easy on the pockets and fun to play as well. The colorful interface of the game is a welcome treat. • Ace Club: This game is for the experienced players. While obviously, anyone can play it, having a bit of a knowhow around the game helps in moving forward quickly. Moreover, there are extra treats for the loyal gamers of HunkyBingo. This room is only accessible to them. The jackpot is of £250. • Last call: This is for nocturnal bingo players who like to stay back at the game even after everyone has left. The jackpot here is £100. All you have to do is stay up late and play the last of the games. The developers of HunkyBingo site have taken special care in crafting a functional website on the mobile platform. The minimum withdrawal on HunkyBingo is £5. All of the prominent payment methods such as Visa, Mastercard, PayPal, EntroPay, Neteller and Paysafe card are acceptable on the site. 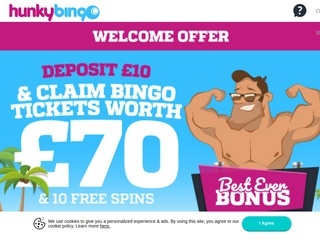 Security is a high priority for the developers of HunkyBingo, which is why they have made sure that the site is fully protected against any fraudulent activities. The payment section, as well as user data, is fully secure.